Judy's training provides her with the background and skill required to offer programs for students of all ages and abilities. 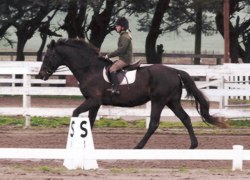 "I rode with Judy at Three Gaits for seven years while living in Northern California. Despite nine years in the US Pony Club, I learned more about horses from Judy and she helped me to put my Pony Club knowledge to practical application. 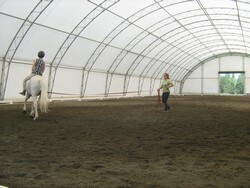 The riding instruction was always insightful and on-point, and the school horses perfect for various levels of learning. 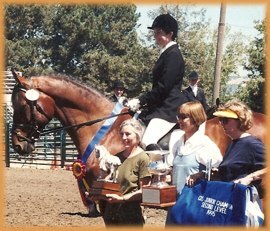 With Judy we competed in three day events, recognized dressage shows and championships. We attended clinics with some of the best instructors in the country, and we went on trail rides and beach picnics. I learned more than just about horses. I grew up at Three Gaits, learned responsibility, worked hard and practiced teamwork daily. 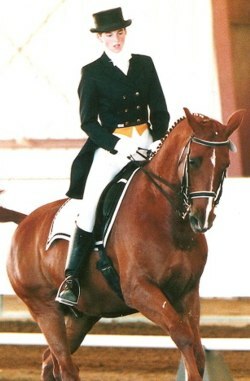 When I moved away to college I became an instructor at Mill Creek Equestrian Center, one of the best eventing and dressage stables in California, putting into practice all of the lessons I had learned from Judy. All of my success in riding and in life can be attributed partly to her. I cannot adequately express here all that she and my peers at Three Gaits mean to me. We became best friends and family, and we still are." "...your presence in my life and all our lives as riders was an enormous influence. It's also true that you had a hand in raising me, certainly. As much as I could be both whiny and defeatist in the face of difficult riding moments when I was little, my only lessons weren't that a good thing is often hard, and that a practice is never a finished product. It was also about learning to have a strong empathy for both a big, complicated piece of china as a partner and for all of us as fellow riders and companions. And even if I was a slacker about cleaning tack back in high school (and I was) I knew enough to admire the dedication, teaching skill, and commitment of you and my friends at the barn unreservedly. You created a world for all of us that is far from many people's idea of riding and antithetical to the natural self-centeredness that is hard to avoid at that age (I'll speak for myself on that one!). ...my mention of the books was no accident, I think you single handedly recommended most of my favorite books during high school in one list when I was stuck during an assignment!" 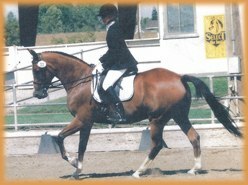 "Judy is an incredible teacher with the rare ability to articulate and simplify the complexity of riding dressage. She has a great ability to communicate her passion for horses and to teach her students to always put their horse's needs first. I began taking lessons from Judy 23 years ago. "Judy was much more than a riding instructor. She was a mentor who shaped the person I became, imparting her strong sense of integrity, loyalty, and honesty. 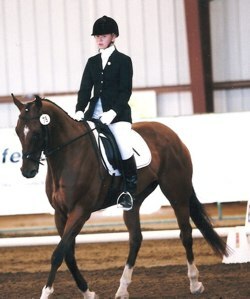 She taught me responsibility as well as horse care, love of reading as well as jumping and dressage." "I have known Judy Herman for a number of years to be a committed, experienced mentor to young people who want to learn more about horses. 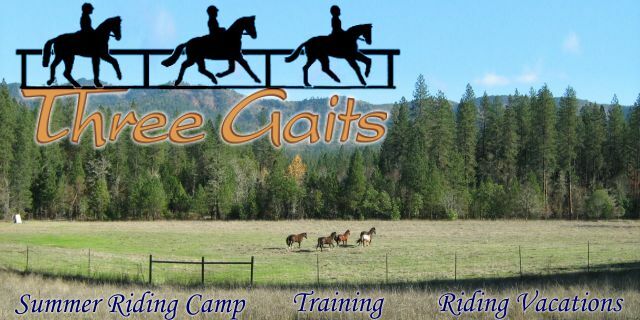 She offers camps and programs allowing horse enthusiasts to share a deeper, hands on learning experience of how being safe and having fun with horses really should be done." "I have known, ridden under, and referred people to Judy for more than a decade now. I have seen her former students properly prepared to go on into the high ranks of 'upper level' riding with the base that is essential for the quality of work that is expected by international trainers. My personal experience with Judy is that she has an eye for correct work and always encourages people to be the best that they can be. I have a great respect for her ability to stay even and neutral in the horse world. She is liked and maintains long-term friendships in the horse world with professionals and amateurs alike. Judy has a resume which I think is rare to find these days. She has paid her dues in her own personal riding education which never comes to completion, but is an ongoing work of art. 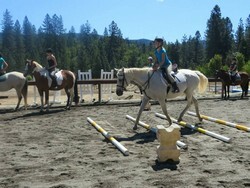 She provides quality school horses which are priceless to learn on. She challenges her students to grow, but never out of intimidation. It is always: 'of course you can.'" 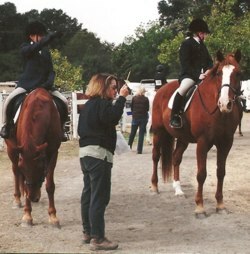 "I have observed Judy's students at horse shows for many years, in addition to working with those of her students in the Pony Club. 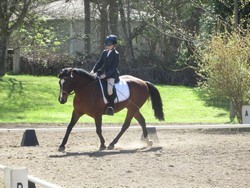 Her students are always well turned out, and display an excellent foundation in the basics of riding. Their sportsmanship and manners are outstanding. 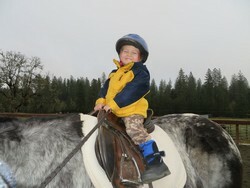 They always remember to thank the horse show staff at the end of the day." "Without the years of excellent training from Judy, I would never have been able to accomplish my goal of becoming a professional trainer. She has been an inspiration, not only in her commitment to the quality of the work, but also in her horse management skills. 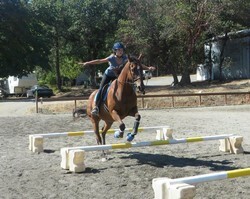 I was lucky enough to ride some amazing horses while working with Judy. She taught me that their care and comfort always came first. I could not have asked for a better teacher and mentor growing up. I owe much of my success to Judy!"